I would ask you to close your eyes, but then you couldn’t read my story. Imagine if you could close your eyes and say ‘alakazam’ and go back in time to the location of the Falls of the Ohio State Park when the coral beds were alive! 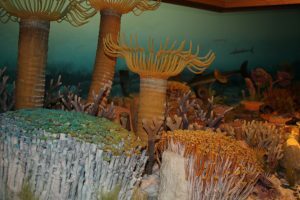 What would you experience if we could go back to the Devonian Period? That is not surprising, because the Falls of the Ohio – in fact most of the central and eastern United States – was covered under a shallow sea. Since we are talking magic, let’s put on a snorkel, mask and flippers and swim around to investigate beneath the waves. Oh, and don’t try to ask me any questions under water! Look at all the corals! There are a lot of different shapes, sizes and colors. See that long, tall one? It is the largest horn coral in North America – almost four feet long! Most of that type is a foot and a half to two feet long (45 to 60 centimeters). The soft body of a coral is called a ‘polyp.’ Watch those soft tentacles; I don’t want you to get a nasty sting! Now, look to your left. See those two mounds? Those are two different types of colonial coral. One has small polyps with a ring of tentacles about an inch across (2.5 centimeters); the other colony has really tiny polyps. You have to swim down close to see them – no touching! They are only a ¼-inch (3 millimeters) wide. The colony larger coral is related to the horn corals, even though it doesn’t look anything like it. We call them Petoskey Stones because they are famous as polished rocks along the shore of Lake Michigan near the town of Petoskey. At the state park, we call them Prismatophyllum. That is their scientific name. The colony with the smaller coral polyps (remember, coral is not a plant!) is commonly called Honeycomb Coral. It is not related to horn corals, although is still a coral. If you look over here where the colony is dead, you can see the honeycomb pattern. It is a type of coral called Favosites, which means ‘honeycomb.’ If we were to swim around this area for a long time, you would see Favosites in all sizes – from more than 10 feet (3 meters) across to colonies smaller than your thumb. Swim this way – I think I see a type of sponge – and no, it is not wearing square pants – or any clothing at all! This mound-shaped colony is almost as wide as you are tall! Look closely, you will see two differences from a coral. First, there are no tentacles. Sponges do not use stinging tentacles to trap food. Second, see those star-shaped patterns? Those allow the water to filter inside the sponge where the colonial animals can feed. What? You don’t think it looks like a sponge? That isn’t surprising! It does not look like modern sponges. These have the lovely name ‘stromatoporoid.’ I know, it sounds like an Italian meatball sandwich. The more you snorkel, the more sponges you will see. They eat tiny plankton. Tricky current, isn’t it. You really don’t even have to kick your feet to see new things. Look in this open white sandy area, between the larger colonies. See those little horn-shaped creatures? They are other types of horn corals. Notice that some lay against the sea bed, while others are shaped like little palm trees and are upright. If you swim down, you’ll see they all have stinging tentacles. They are different heights above the sea floor, so they aren’t in direct competition for the same food (mostly plankton or small animals that swim or float by). Those bushy things over there are stag-horn coral. They are colonial corals that grow like a hedge, with lots of branches. Unlike a bush, see how the branches interconnect? They are related to the honeycomb corals (and also eat plankton). What’s that? You found something? Let’s take a gander at it together. See that slender stalk with the flower-looking thing at the end? You found a crinoid – they are related to starfish. Imagine a starfish on a stalk, having long, delicate tentacles with tube-feet, and that’s a crinoid. Unlike corals, crinoid tentacles (really, arms) are made of tiny calcite plates. You would need a magnifying glass to see them. You want to guess what they eat? Right! Plankton! Hey, look over here – see those large shells? Good guess, but they aren’t clams. They are an animal called a lamp shell or brachiopod. If you look at the shell closely, you will see they aren’t mirrors of one-another. With a clam, the top and bottom shells are mirrors of each other. With lampshells, the left and right side of each shell are mirrored. I’ll give you one guess – what do they eat? Correctamundo! Plankton! See that pattern in the sand? It looks like it was made by small feet. Let’s follow them and see who made the tracks. There! Behind that patch of seaweed, looks like an underwater roly-poly, doesn’t it? You’re right, that’s a trilobite. These fellows are not common as fossils, even though they got pretty big. This guy is about three inches (8 centimeter) from head to tail, excluding his antennae. See how it rolls up when it gets startled? That is one of their defense mechanisms. What does a trilobite eat? Hah! Fooled you! They are scavengers and eat whatever they can find in the sand and mud in or on the sea bottom. Do you notice something that is missing? Where are the fish, you ask? Good question, especially since the Devonian is called the ‘Age of Fish.’ Fish aren’t found in the coral beds. We don’t even find microscopic teeth or scales. They are around, but are too scarce to be found as fossils in the coral beds. When we examine the upper fossil beds, fish remains become more common. Tired of breathing through that little tube? Let’s tread water and catch our breath. Look at your surroundings – blue skies, a few puffy cumulus clouds near the horizon. Excellent observations, my friend! We are in the tropics – that is the only place that limestone can form on the ocean floor and where coral are most abundant. Stony coral don’t do well in cool water. As for the Sun, during the Devonian Period, the Falls of the Ohio area was almost 30 degrees south of the equator! That’s like southern Brazil! Since then, continental drift has moved the fossil beds north at a rate that is similar to how fast your finger nails grow. Ready to return to the present? That’s ‘alakazam spelled backwards. We are now back to the present. You can open your eyes. What? You never closed them. Oh, how embarrassing. What were the fossil beds like during the Devonian Period? What do most animals eat? Does a sponge use sting cells to capture food? Was the Falls located north or south of the equator during the Devonian. A fish found in the coral beds? How do we know?